$23.95 In stock. Order in the next 1 hour, 10 minutes and it will go out today! Everybody knows a Rising Card effect, but do you know one that is visual and easy to do? Dr. Schwartz to the rescue! 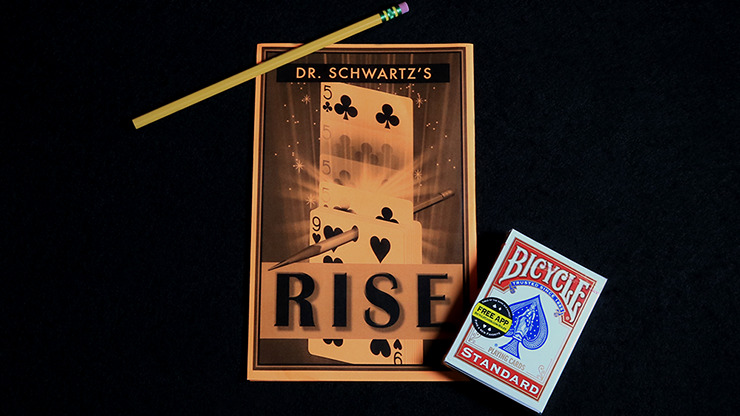 In RISE, a spectator selects a card from a deck with holes in one end. The card is lost in the deck and a pencil inserted through the holes, suspending the deck. Yet, the selected card still rises from the deck! Everything examinable at the end! It doesn't get much better than that. Time to redefine your spectator's definition of impossible!